Michelle Gamage, 24 hours Vancouver -When the Order of Canada organizers called to ask if he would accept the Governor General’s 2013 Lifetime Artistic Achievement Award, Andrew Dawes thought they had him confused with another person.But there was no mistake. Despite developing focal dystonia, also known as writer’s cramp, in 2006 – which quickly ended his 59 years of performing – the renowned violinist’s years of teaching and 3,000 performances were enough to win him the award. WENCY LEUNG - The Globe & Mail - Kylee Taylor was distraught. For nearly two years, her teenage son, Kieran Porter, had seen multiple doctors and undergone countless medical tests, but none provided an answer for his alarming and mysterious illness. 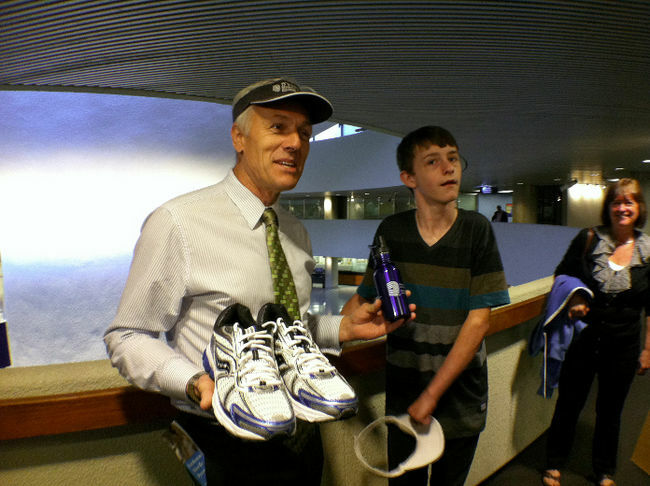 TORONTO - Matthew Sheppard drew attention to dystonia Thursday by offering to help Mayor Rob Ford in his workout regime. The Expositor, Brantford, Ontario - Michelle Ruby - In the late 1990s, Thomas Wade was living his dream. The boy from Burford who had played every county fair and local smoke-filled barroom, years before he could legally have a drink there, had finally hit the big time. Read More of the Expositor article.